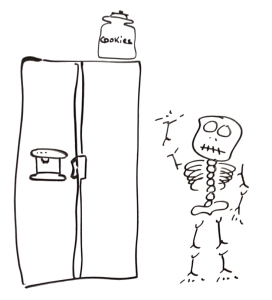 Want to know a little more about the Skeleton? SKELE-HISTORY - A little bit about how it all began. Not the whole story, though...if you go further back in history you might hear about a scary skeleton with heavy breathing that ran around screaming and ripping people's hearts out—EEEAAAH!!! THE SKELE-PROCESS - How a skeleton is born, and what kind of nurturing is required to bring him to life. Neat stuff! OTHER PEOPLE'S SKELETONS - Not a pretty sight!